Harrigan Papers: John B. Slater letter to Harrigan story about buildings and people around the Examiner office, undated You can obtain high resolution copies of this image from the Jim McMillan Research Library at the Stevens County Historical Society Museum, 509-684-5968 or email schs@ultraplix.com. You can obtain high resolution copies of this image from the Jim McMillan Research Library at the Stevens County Historical Society Museum, 509-684-5968 or email schs@ultraplix.com. 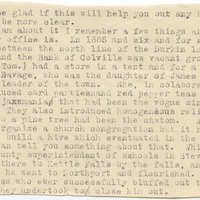 “Harrigan Papers: John B. Slater letter to Harrigan story about buildings and people around the Examiner office, undated,” Crossroads Archive, accessed April 19, 2019, http://crossroadsarchive.net/items/show/15253.